Germany face their day of reckoning at the World Cup on Wednesday with the holders needing a clear win over South Korea to be sure of reaching the last 16. Joachim Loew's team hope to follow in the footsteps of Argentina after the 2014 World Cup finalists scraped into the last 16 after a dramatic 2-1 win over Nigeria on Tuesday. Argentina and Lionel Messi will play France, who were held to a goalless draw by Denmark on Tuesday, in Kazan on Saturday in their last 16 tie. Argentina, the losing finalists in 2014, were heading for a humiliating World Cup exit before Marcos Rojo scored a stunning winner on 86 minutes to send Nigeria home. Messi scored his first goal at Russia 2018 in the first half, but Victor Moses equalised shortly after half-time to put Argentina on the brink of bowing out before Rojo's late winner. Croatia were confirmed Group D winners after their 2-1 win over Iceland and will play Denmark in Nizhny Novgorod on Sunday in the last 16. On Wednesday, the focus falls on four-time winners Germany, who must beat South Korea by two or more goals in Kazan to guarantee advancing after a shaky start in Russia. The Germans stumbled to a shock 1-0 defeat to Mexico, then needed a stunning 95th-minute winning goal from Toni Kroos with 10 men to beat Sweden 2-1 and keep alive fading hopes of progressing. "We have to be masters of our own destiny," said Germany head coach Loew. However, Germany's path to the second round is littered with obstacles as all four Group F teams can still qualify. Even bottom side South Korea can go through by beating Germany if Sweden lose to Mexico in Ekaterinburg, providing the Koreans finish with a better goal difference than their rivals. South Korea coach Shin Tae-yong says his team have just a "one percent chance" of beating Germany and even star forward Son Heung-min played down their chances of an upset. Should the Germans qualify as Group F runners-up, they potentially face a mouth-watering last 16 clash against Brazil in Samara on Monday. Things are more straightfoward in Group E, where Brazil need just a point against Serbia in Moscow on Wednesday to be sure of reaching the last 16. Victory will confirm them as group winners, but Brazil head coach Tite is warning their under-fire superstar Neymar cannot be expected to win the World Cup on his own. The world’s most expensive player, who battled back from a fractured metatarsal to be fit for Russia, took plenty of flak despite scoring in the 2-0 victory over Costa Rica last Friday. Both Brazil goals came in added time and Neymar wept after netting their second, but was later accused of diving after the video assistant referee over-turned a penalty awarded to him when replays showed there was no contact. "There is an excessive responsibility on him in terms of success and that is not the way to go," said Tite. "Maybe we need one more match and he will be in his full form physically and technically, because he is outside the normal standards." Should Neymar and Brazil stumbled in Moscow, Switzerland are hoping a win over Costa Rica in Nizhny Novgorod on Wednesday could catapault them into the last 16 as Group E winners. The Swiss are second in the table and level on four points with Brazil, but have an inferior goal difference. "I think we should get this done, we want to top the group," said Swiss head coach Vladimir Petkovic. The Swiss camp is promising no more controversy after FIFA fined three players for their "double eagle" hand gestures to represent the Albanian flag in the politically-charged victory over Serbia. 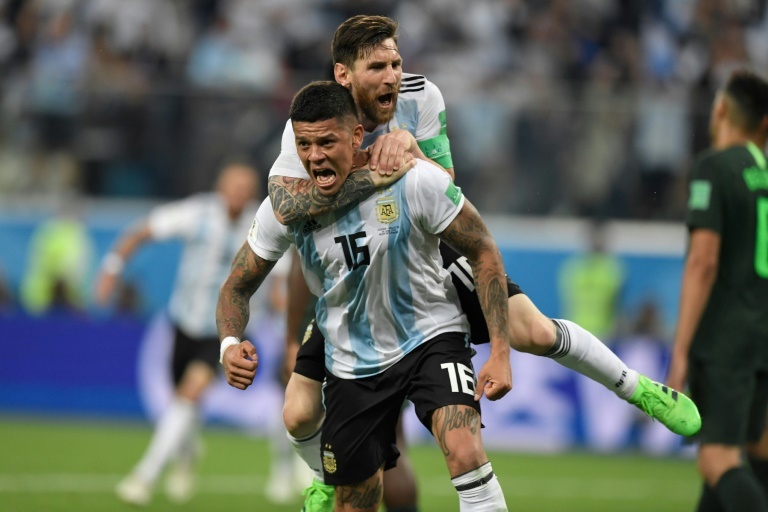 Marcos Rojo (lower) celebrates his goal with Lionel Messi after his late goal fired Argentina into the last 16 of the World Cup to seal a 2-1 win over Nigeria on Tuesday. Brazil forward Neymar can not shoulder the Selecao's World Cup hopes alone, the South Americans' head coach Tite said ahead of their Group E clash with Serbia in Moscow.